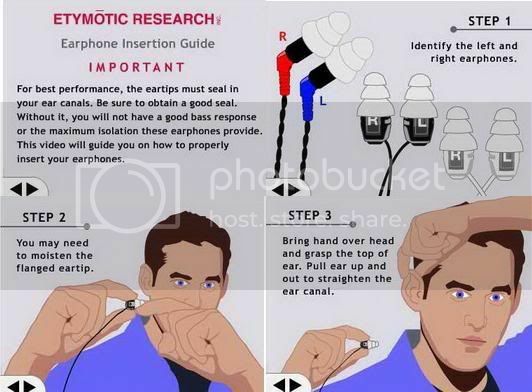 [Disclaimer]This guide may contain error(s) and is only meant to provide general / basic information for new in-ear-canalphones users. Some information within this guide has been copied or modified from the Etymotic, Shure, Headwize, Headroom and Wikipedia websites. Not all are referenced within the article, but links to the original pages have all been listed at the end (reference section). The credit and thanks goes to the original writer/companies for providing the information online and for free. Thanks. This guide is also hosted at: InEarMatters.net. If you read Chinese / 中文, you can find the translated works here, thanks to a few good fellows @ erji.net. *Don't have time to read all of this here? A PDF version of this guide can be downloaded here. I thought IEM/canalphone is also called 'earbud'? Why noise isolation and not Active Noise Cancellation? Is "burn in" or "break in" necessary for your IEM? Is a headphone amp necessary for your IEM? Are IEMs worth the money? OK, I have a budget now, what class of IEMs should I be looking at? How about Custom Molded IEMs? So I am ready to get some serious IEMs, which companies should I be looking at? 1. What is an In-Ear-Canalphone? In-Ear-Canalphone, also known as canalphone, ear-canalphone, ear-canal headphone, or In-Ear-Monitor (IEM), is a type of Inter Aural headphone that is designed to be used where the user’s ear canal is sealed by the ‘phone. The seal generally serves two functions: 1) to block noise and 2) to form a sealed acoustic chamber in order to achieve a fuller sound. 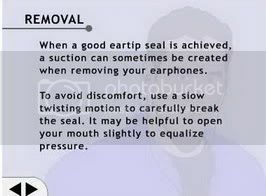 To create such a seal, the earphone’s nozzle along with its tip (or sleeve) is inserted into the front part of the ear canal. Many high end canalphones are custom molded to the user's ear for maximum comfort and a perfect seal. Is it a canalphone or an IEM? Due to its great portability, high sound quality and noise blocking ability, specially tuned (and often custom molded) canalphones have long been used on stage by musicians and audio engineers alike. These canalphones are part of the In-Ear-Monitor-System (IEMS), which can be either wired or wireless. For ease of naming, canalphones used in such system are referred to as IEMs. Later, as canalphone manufacturer began to make high quality canalphones available for the general consumer (iPod generation), the word ‘IEM’ became popular thus replacing ‘canalphone’ as how we refer to all canalphones. Technically speaking, only canalphones on an IEMS should be called an IEM. However, there is no concrete definition of the word ‘IEM’ and it is easier for general consumer to use a simpler terminology. Sometime ‘IEM’ is also used only to refer to high quality canalphones. For the purpose of this article, we will refer to all canalphones as IEMs. 2. I thought IEM/canalphone is also called 'earbud'? No, IEM and earbud each refer to two different kind of Inter-Aural headphones. 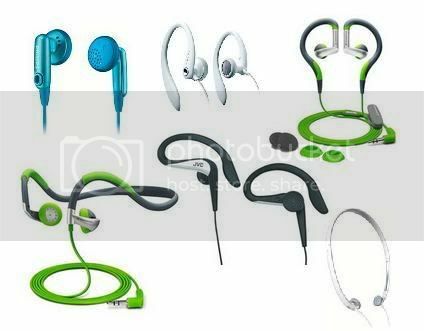 Inter Aural headphone, or in-the-ear headphone, is sometime known as earphone. It refers to headphones with a transducer small enough to be placed/worn in the ear. The two major types of inter aural headphone are earbuds and canalphones. 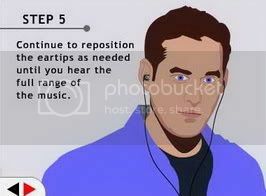 Earbuds are worn in the opening of the ear, often just outside of the opening of ear canal. They can have a headband or clip-on to increase comfort, but they do not form an air-tight seal in the ear canal as they are not intended to go into the ear canal. 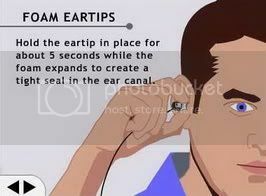 On the other hand, canalphones/IEM are intended to be partially inserted into the ear canal to create an air-tight seal (for reasons see first question). 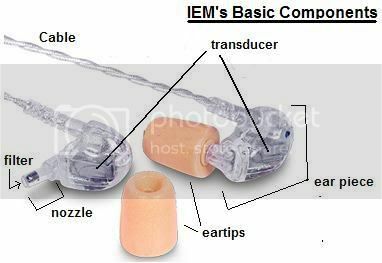 The reason why so many websites mislabeled IEM as 'earbud' is simply because they don't understand the differences. 3. Why noise isolation and not Active Noise Cancellation? Despite their larger size, ANC headphones do not always provide better noise reduction in comparison to IEMs. Also, many ANC headphones’ sound quality (SQ) is often found to be ‘second class’ at best (in comparison to the price you pay for them). In contrast, IEM provide better noise reduction without sacrificing SQ. There are two major types of transducers used in IEMs: Dynamic and Balanced Armature (BA) transducers. Dynamic (moving coil) transducers are often found on low to entry class IEM due to their ease of availability and lower cost (relative to BA transducer). They commonly range from 8mm to 16mm in diameter. Dynamic transducers are known for their ability to create a more powerful bass response since relatively more air is moved during sound reproduction. More air movement means stronger bass sensation as we tend to ‘feel’ low end bass more than actually hearing it. The downside of using dynamic transducer on IEMs is its larger size. It is also worth noting that many big brand name manufacturers use dynamic transducer of relatively low sound quality in their IEMs; therefore you should avoid most of them as much as possible if sound quality is your priority. Of course, there are also IEM manufacturers who specialize in producing high end dynamic transducer IEMs, most noticeably Future Sonics, one of the very first IEM manufacturers. BA transducers have the benefit of being really small, therefore you can often find many IEM makers using 2 or 3 BA transducers in each side of their ‘phone. By dedicating at least one of the BA transducers as a woofer, multi-ways IEM tend to have better bass performances than most single-way BA transducer IEM (but not always). The use of multiple BA transducers partially solves the bass problem as BA transducers move a lot less air than dynamic transducers (and noticeably less low end bass). The downside of BA transducers is its higher price tag. There are also hybrid IEMs (ie. UE Super.fi 5 EB) that utilize both dynamic and BA transducers together in order to have the best of both worlds. However, reviews of such type of IEM are often mixed. For more info about transducers, please visit wikipedia. Three types of eartips can be commonly found on IEMs: soft plastic (also known as ‘flanges’ or ‘sleeves’, often silicone or PVC based), foam, and custom mold with hard acrylic or soft silicone materials (there are also hybrid hard/soft mold, but less common). Soft plastic eartips have two versions: Universal and size-dependent. Universal soft plastic eartips such as Etymotic tri-flanges and bi-flanges allows the user to insert the eartips to a suitable and often relatively deeper canal depth to create the seal (which sometime can be seen as too intrusive to the user). Size-dependent soft plastic eartips such as Shure soft flex sleeves have three sizes: small, middle, and large. 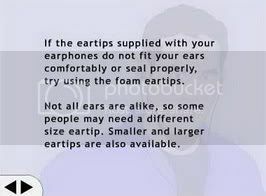 The user selects the size of the eartips based on the comfort of the seal to their ears. Beside custom molds, foam tips are generally considered to be most comfortable and provide a better seal. The tighter seal means foam tips tend to give a warmer, fuller and often more enjoyable sound than soft plastic tips. Foam tips also have two versions: Universal (i.e. Shure yellow foam) and size-dependent (Shure black foam). Most foam tips are not washable and require replacement after a few weeks of use (see section: Cleaning and maintaining your IEM and eartips). Foam tips made by Comply are often considered to be the most comfortable. Comply also manufactures different types of foam tips for different IEMs. Unlike soft plastic tips, foam tips are often specific to the nozzle diameter and cannot be used on IEMs with a different nozzle diameter (unless a modification has been made). Shure black foam is one of most popular foam tips on the market as they are quite comfortable and designed to be user cleanable (see section: Cleaning and maintaining your IEMs and eartips). They are now made with dots on the bottom of the sleeve. 1 dot = small, 2 dots= medium, 3 dots= large. For real measurement, please read the following PDF file provided by Shure. Custom mold are commonly found on high-end IEMs (or ‘custom IEMs’) where the transducers are part of the tips. However, custom molded tips can also be ordered to fit universal IEMs (IEMs that are designed to use soft plastic or foam tips). Recently, custom IEMs have become more and more popular in the mid-end IEM market too (like those found on Livewire and FREQ). The biggest advantage of custom molds is its fit. Since the mold is custom made to match each user, it ensures a perfect seal while providing the best comfort and SQ (which is why many musicians prefer custom molds). For visual reference of different type of eartips, please visit this link. For visual reference of different IEMs' size, please visit this thread. Choosing the correct tip size to use on your IEM ensures a perfect seal, which in turn translates into maximum comfort and high sound quality. Using a tip that is larger than needed often leaves the user with aburning sensation or pain in the ear canal within a very short period of use. Using a tip that is smaller than needed will result in either a weak seal or air/sound leakage. 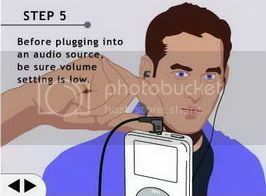 In such situation, the user will notice that bass is weaker than normal or not presented, and the IEM tips will fall out from the ear canal very easily. One should note that despite having found the best fit, inserting a foreign object into the ear canal can feel very uncomfortable the first few times. In order to overcome this issue, a bit of patience is often needed in addition to choosing the correct type of tips of the right size. We have talked about the importance of a perfect seal in regard of SQ and the basic design of eartips; now we will discuss how other factors will affect comfort, mainly regarding flanges used in IEMs (Foam tips generally don’t get affected as much by the factors below as they are often very soft and don’t feel as intrusive). Most single flange IEMs, noticeably those like the EP-630 and CX300, allow the user to fully insert them shallowly (roughly 8~9mm fully inserted). The shallow insertion means less intrusion and isolation, but more comfort for the user. Most multiple flanges IEMs will require the user to insert them deeply (>9mm fully inserted). Deep insertion means a better seal thus more isolation, but less comfort. As the most commonly used eartips, soft plastic eartips can be made from silicone or PVC with various thicknesses. Generally speaking, silicone is softer thus more comfortable than PVC. Note that silicone tips don’t all have the same hardness/sponginess. The rule is, the thinner the eartip the more comfortable it will be. However, thinner eartips will provide less isolation. Example 1: UE single flange – shallow insert, hard/spongy, thick, large earpiece = not so comfortable, but OK isolation. Example 2: CX300 single flange – shallow insert, soft, thin, small earpiece = comfortable, but less isolation. Example 3: ER6i tri-flanges – deep insert, soft, thick, small earpiece = not so comfortable, but great isolation. Example 4: SA6 bi-flanges - deep insert, soft w/ slightly spongy, mid thickness, small earpiece = comfortable with great isolation. Remember: It takes time to get used to certain kind of eartips, therefore don’t rush to judgment. Even though personal preference plays a big role as to what constitute comfort, it often will change with time. My advice to you is, give both yourself and your IEM some time before calling it quits – you might even fall in love with what you found to be uncomfortable at first. 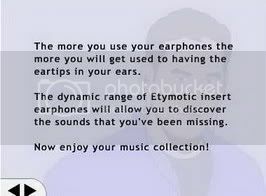 View Earphone Insertion Video on Etymotic’s website. For best results, moisten the soft plastic eartips before insertion. With your left hand, pull up and back on your right ear to straighten your ear canal. Carefully insert the right IEM so that it seals deeply and comfortably in your ear. Repeat procedure for the left ear, using the left IEM.. Remove IEM slowly with a twisting motion to gradually break the seal. Make sure the shiny side of the foam tips will be facing your eardrum when inserted. 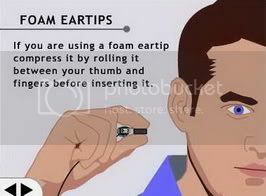 Compress the foam eartip by rolling it between your fingers. With the opposite hand, pull up and back on your ear to straighten your ear canal. Carefully insert the foam tip into the ear canal, holding the IEM in place until the foam expands to produce a seal. Set the volume control of the audio source to minimum. Insert the 3.5mm IEM plug into the headphone jack. Set the volume control to a comfortable listening level. Using IEM while driving a motorized vehicle, operating machinery, bicycling or jogging is not recommended, because you may not be alerted to potential danger. Do not use the IEM at excessively loud levels (see more at section: IEM and Health). Do not pull on the cord to remove it from the jack or the ear. Avoid bending the barrel of the cord. For universal IEMs: If at any time the eartips do not maintain a grip on the earphone nozzle, discard the tips, clean the IEM nozzle and replace the tips with a new set. If one or both side of the IEM stop working or has reduced volume, change the IEM’s filter (see note 1 below) or clean the nozzle opening with the provided tool. For custom IEMs, clean the acrylic shell of the IEMs with tissue and make sure the nozzle isn’t blocked by earwax after every use. Clean the tips and cable when needed (at least once a month). If you exercise with your IEMs, you should clean the cable and tips more frequently, especially areas of the cable that come in contact with your skin. This will ensure the longevity of the cable and prevent skin oil from interacting with the cable. Do not use alcohol-based cleaners or those that contain bleach. A damp paper towel with mild soap will suffice. To clean the tips, remove it from the IEM first. To do this, grasp the tips between your thumb and index finger, and twist and pull the tips from the nozzle. Do not pick at the tips as it may cause them to tear. Remember, the IEM's cable, like any cable, will eventually harden up and crack. The more you care for your IEM, the longer it will last. However, different manufacturer use cables of different quality - some seem weak but are actually strong, and some seem strong but crack easily. In the long run, a user replaceable cable is better than a non-replaceable cable, and sometimes a replaceable cable can actually make a difference in SQ. Carefully clean the IEM housing and nozzle to remove any wax or oil residue. Be careful not to let any moisture enter the nozzle opening. If moisture does enter the IEM it may not perform properly. If moisture does cause one or both IEM to function at reduced level, leave the IEMs out of their carrying case in a dry, well-ventilated area, which should allow the moisture to evaporate in 24 to 48 hours. Soft plastic tips should be washed in warm soapy water when they become oily or dirty. Un-washable foam tips should be discarded if they become dirty, dry out, or no longer compress and expand fully (see note 1). Shure black foam tips (known as ‘Shure olives’ among head-fi’er, introduced in Spring 2007) can be washed by simply wiping off any debris from the outside of the tips with a warm, damp paper towel. Note 1: Experiment done by Head-fi’er has shown that by gently dipping the foam in pharmacy’s grade peroxide solution (also know as eardrop, often used for dissolving earwax) for a short period of time (15 minutes or so) can partially clean the foam and extend its lifespan. The same principle applies to user removable filter and earwax clot on nozzle opening. It is possible to experience a static electricity discharge though IEMs. In a cold climate with low humidity, a static charge may build up on one's body. The cable that carries the audio signal from the headphone jack to the IEM has metallic wire inside. This wire is also a path to ground through which the static charge can travel. Though one's ears are touching the plastic parts of the IEM, there is metallic wire inside. A static charge often has a high enough voltage to leap from one's ear to the metal inside of the IEM, discharging the static electricity via the cable and into the device playing the audio signal, e.g., CD player or MP3 player. The amount of electrical current in such a static discharge is not harmful, though the discharge itself can be startling. It is important to note that such static discharges are "acts of nature" and do not indicate that one's IEMs are defective, nor will the static discharge cause harm to the IEM. Note: If you are regularly shocked by your headphone, it could indicate a leakage in the wiring. You should contact the manufacturer for repair in such a case. 11. Is IEM "burn in" or "break in" necessary? There is no definitive scientific answer as to whether headphone burn-in exists or not, so don’t bother asking for one. It is often just a case of choose-to-believe. If you do believe in burn-in, the general consensus is that BA based IEMs don't benefit (as much) from the burn-in process while some dynamic IEMs do show signs of improvement after a period of burn-in. 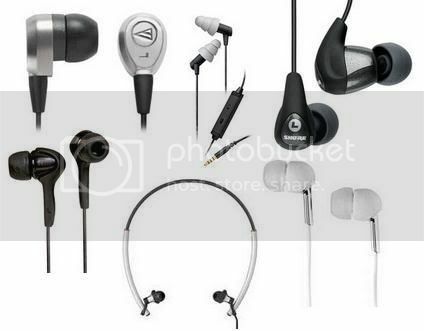 Do a search in various forums regarding individual IEMs for more information. A piece of advice: If you are really considering burning in your IEMs, two days (roughly 50hrs) of random music playback with your normal listening volume is generally good enough for most IEMs- this is from the writer's personal experience with multiple IEMs. 12. Is a headphone amp necessary for IEMs? Some (though very few) IEMs do need an amp to shine, but not all. Less sensitive IEMs, such as Etymotic ER4S, often require an amp to function at its best. However, most IEM on the market do not need any amp to reach their full potential, even though amping may sometimes show an improvement in SQ. The easiest way to identify which IEMs need amping is to look at the specifications. The general guideline is: IEMs which have less than 50 ohms impedance and more than 98 dB on sensitivity most certainly don't require an amp to sound their best. Two of the most common complaints from new IEM users are microphonics (or ‘cable noise’) and bone conduction. Microphonics is the phenomenon where the IEM user can hear noise (caused by IEM’s cable brushing against clothing or another object) transmitted by the cable into the IEM. Bone conduction is the phenomenon where the IEM user can hear noise (caused by body motion such as eating and walking) transmitted within the body. Both of these phenomenon are side effects of sealing the ear canal and forming an acoustic chamber that amplify such noise. Microphonics can be ‘grounded’ by wearing the IEM in over-the-ear style or using a shirt-clip to stop the sound transmission. Some companies offer better cables that don't exhibit microphonics as much. Bone conduction can be limited by avoiding eating while using IEMs and walking softly (or changing shoes). In the end, most users will get used to both and eventually forget about them. Sometime IEM users can hear a background electrical noise from their source when the volume is low; it is know as 'hissing'. Most IEMs are very sensitive therefore it is easy for them to pick up electrical noise that generally other headphones would ignore. There is no actual fix for this issue, but sometime adding an in-line resistor (to increase the impedance and lowering the sensitivity) seems to work. Also, certain sources (such as one type of HDD based iPod) are known to produce more electrical noise. Sometime, IEMs with highlighted 1KHz ~ 10kHz region in sound frequency are also referred to as being 'sibilant' or 'harsh'. The problem is, these kinds of IEMs produce very sharp sounding treble that can often be very irritating and uncomfortable during long term listening. This kind of sound is most commonly noticed in female vocal presentation. Due to the fact that everybody has a different hearing freq. resp., some IEMs will sound sibilant to some while completely fine to others. There is no real fix for this issue; however, EQing is perhaps one of the most effective solution, followed by modification of the IEM itself (mostly of the filter and nozzle). Do not assume a $400 IEM will last 4 times (or twice on that matter) longer than a $100 IEM, or a $1500 custom will always outlast $15 earbud. Regardless of the price you paid, the IEM is only warranted by the date stated in the warranty terms and not a day more. Paying more is neither an indicator of durability, nor a binding contract for user to receive above-and-beyond out of warranty (OOW) service. Most companies have a certain set of procedure to deal with out of warranty models. Some companies will repair with cost; some will offer discounted replacement (of same or newer models); some may not been able to do anything at all. Do not assume your IEM will always get OOW repair as some companies simply do not have a repair department nor have the needed parts in stock (because their factory is half a world away). It is more common to find company replacing broken products rather than repairing them because keeping a repair department usually is much more expensive than sending out brand new replacement. As a buyer, it is your responsibility to find out what kind of OOW service a company provides since it is not covered by the warranty terms. This information is usually easily to find online or can be obtained by emailing / calling the manufacturer’s customer service department. If you do not find such business practice to be acceptable, the best advice is not to buy expensive IEM. Please realize that it is often the same reason that makes an IEM expensive that also makes it susceptible to break down. You can find the same logic behind expensive high-end sport car which required much more maintenance than your average-joe’s Honda / Toyota. Remember, most manufacturers do not claim their more expensive models will last longer than their cheaper models, and thus you should not assume that as well. IEMs are often mistaken as a kind of health hazard which is responsible for hearing loss and ear infection. The fact is, IEMs are very safe when properly used. Secondly, your body will respond to any object inserted into your ear canal by producing more ear wax. It is a way for your body to defend itself against foreign object and the increase of bacterial population due to the sealed moist environment. Therefore, it is recommended that you occasionally remove your IEM during use to allow air circulation and canal well relaxation (and for your middle/inner-ear to catch a break from the constant sound wave bombardment). Cleaning the wax out of your ear canal on a regular basis is also recommended. However, please ask your doctor how to safely clean your earwax before attempting to do it yourself. Accidentally pushing earwax into the inside of your ear canal may result in clotting or even infection (if the clot break your eardrum). In case of ear infection, do not use any kind of headphone. Visit a doctor immediately. One extra note: humans don't naturally expose themselves to long periods of noise, even at low sound pressure levels. A recent study done by WHO has suggested that although low noise environment (as low as 45 ~ 55dB SPL) doesn't cause hearing loss, it does have a negative impact on human health. People who constantly expose themselves to low noise environment are much more prone to develop serious illness, both physically and mentally. It is my advice, though it may not be based on any concrete evidence, that you should be cautious when you decide to listen to your music continuously for a long period of time, even at a low volume. We all love music, but it doesn't mean we have to listen to it 24/7. In short, please listen to your music at the minimum volume you need, keep your ear canal and IEM clean, and don’t listen music continuously for too long. Remember: hearing loss is irreversible, so please use common sense and take care of yourself. For more info on hearing protection, visit Etymotic. Although the human hearing range is listed at 20 Hz to 20000 Hz, most adults can't actually (or at least have difficulty) hear sound above 16kHz, especially once a person passes his/her twenties. Don't worry about losing treble/detail over 16kHz, as humans tend to interpret sound between 5kHz to 16kHz as 'high' and most details are actually on the lower region. Some of you might have read elsewhere that although humans can't hear sound beyond 20KHz, they can still feel the presence of ultrasound (and the harmonic distortion caused by ultrasound) and it does have a positive effect on SQ (*the studies involved are controversial, but let’s assume the conclusion is real). However, given that almost all CD, lossy and lossless music produced these days have a cap of 20KHz in recording / encoding, we can safely conclude that most music we listen to these days doesn't come with any meaningful sound beyond 20KHz that can be reproduced by your headphones or IEMs. If you want to listen to a recording that does include sound beyond 20KHz, you'll have to go back to analog record (LP) or get SACD or DVD-A, but mind you, you'll still need equipment that is capable of playing those sounds back. For a better understanding of which IEM is more detailed, you would be better served by reading a review (or better yet, auditioning it). Note that, although freq. resp. does tell us a bit about how headphones (including IEMs) might sound, it doesn't tell us how good it will sound. 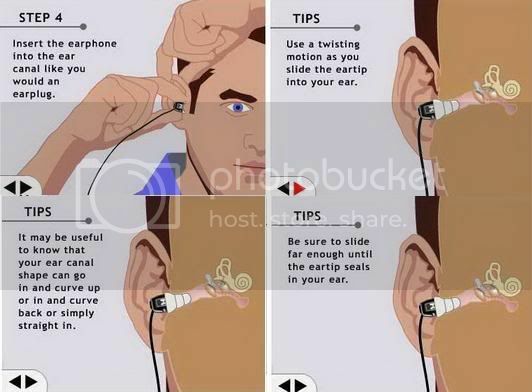 When it comes to picking up a pair of headphone, your ears are much more trustworthy than your eyes. Why do headphone manufacturers highlight frequency response for over 20kHz or 30kHz when they know it has little or no direct impact on SQ? Because the general consumer doesn’t know the facts and often believes 'more is better' without realizing it is often no more than a marketing trick. If you are interesting in learning more about frequency response, here is an article that might provide you with more information. 18. Are IEMs worth the money? This is a question you need to answer for yourself. It is often found that when paying the same amount of money, headphones provides better SQ than IEMs of the same price. However, IEMs have certain advantages over headphones, such as noise isolation and portability, that should also be considered. You need to get your priorities straight: Do you want the best in SQ, portability, or a bit of both? What, when, why, where, how you are going to use your 'phone will determine whether an IEM is best for you or not. Once the decision has been made, you need to figure out your budget limit. Do some research on the forum; don't rush in and post a thread asking for recommendations - more often than not the question has been asked and those who have answered previously might not be in the mood to answer the same question again (or for the tenth time). [-] Price/Performance ratio is lower than large size headphone. 20. OK, I have a budget now, what class of IEM should I be looking at? For US$50 or less, you are looking at the Low Budget Class. Low budget class contains dynamic IEMs that provide relatively poor noise isolation (often using single flange tips) and SQ slightly better (or on par) than the iBud. This class of IEM generally are found to have a very colored sound signature, bloated bass, and harsh or no treble at all. In all, one can define them as a pair of acceptably good earbuds, but with isolation. For $50 to $100, you are looking at Entry Class IEM. In this class, you will find mostly dynamic IEMs with better SQ and one-way BA transducer IEMs. In this class, the SQ is generally considered to be better than your average earbud and able to compete with sub-$100 headphones. For $100 to $300, you are looking for Middle Class IEM. In this class, you will find dynamic and two-way BA transducer IEMs worthy of being classified as audiophile grade. 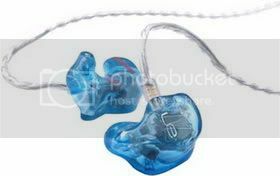 You will also find budget custom IEM in this class, and often they are found to be very good for their price. Beyond $300, you are looking at High End IEMs. Many IEMs in this class are two-ways or above, offering SQ that can rival most big size headphones. If you really have that much money to spend, a custom IEM in this class can easily costs over $1000. Be wary of two things: Firstly, many Low Budget and Entry Class IEM are often overpriced by their manufacturers (to appear of a higher class than they actually are). Therefore, judging them by price alone will not suffice. Secondly, price is often determined by demand. 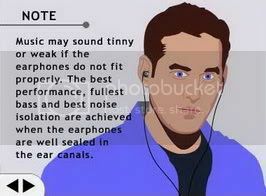 Therefore, you should not use it as an absolute guide when buying an IEM. Sometime great IEMs are undervalued, and sometimes they are overvalued. The best way to determine an IEM's price/performance ratio is to read reviews and ask those who have more experience than you for advice. It would be ideal if you could audition your targeted IEM before paying for them, but unfortunately it is often rather difficult to do so. Reminder: All of the above is just a simplified and generalized point of view. The actual market price might not truly reflect the value of the headphones. 21. How about Custom Molded IEMs? Generally speaking, custom molded IEMs are very high quality, but come with a high price tag. If you are not one of those who has an unlimited budget, budget customs like LiveWires or HearYourSelf.com are among some of the best budget custom IEM makers out there, providing quality products with the advantage of custom while costing much less than products from big name companies like UE. 1) A good impression is essential for a good fit. DIY impression kits are very simple to use, but often the impression isn't as good as those from a professional. Trying to save money and time by using a DIY kit will sometimes end up costing you more time and money as you will need to redo the impression again and again to get a good fit. It has been long regarded that soft mold is superior for making earmolds, even among professionals. However, scientific researches back in 2001 and 2003 points out that as long as the impression is taken correctly and the ear mold manufacturer is competent, there is no distinct advantage (at least not to what was commonly believed) between soft and hard mold regarding seal and comfort. More than often, the process and technique of taking the impression play a large part in getting the custom ear mold right in the first time. 2) Unlike universal IEMs, the product life cycle (how long you are expected to use the product) of custom IEMSs is quite short, often estimated to be less than 4 yrs. 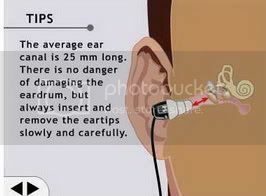 The reason is, your ears will keep growing / changing till you kick the dust, therefore your ears will change in a couple of years rendering your customs useless as they will no longer fit your ears. You should expect to get a new custom (or at least a remold of your old custom IEM) every few years in order to prolong its life. Note, many IEM companies do not re-shell / remold old IEM, thus you should ask the corresponding company about details of remolding service before ordering. There are companies in the market that do provide reshelling service for custom IEMs from another company, or even turning universal IEMs into customs. Of course, there are exceptions, and there are people who are able to use their custom for more than 4 years. The experience varies from person to person in different age groups, thus there is no definite answer to how long your custom will fit your ears. 22. So I am ready to get some serious IEMs, which companies should I be looking at? The above list is not exclusive. There will always be new and better IEM and manufacturers waiting for us to discover, so check out the forum and our sponsor's website regularly. If you wish to see a company tadded to the list, please don't hesitate to reply and request. ***The original LiveWires team is now separated into two companies. EarPeace Technologies (CA) is holding the original LiveWires brand name while In Ear Systems (TN) operates under the new brand name "Fidelity Custom Earphones" while producing what seems to be the same dual driver IEMs (plus new models as well). Dean MS, Martin FN, 2000. Insert earphone depth and the occlusion effect. American Journal of Audiology 9: 131-4. Federman J, Picou E, 2009. Music and hearing protection: A call to action. Perspectives on Audiology 5(1): 3-9. Federman J, Ricketts T, 2008. Preferred and minimum acceptable listening levels for musicians while using floor and in-ear monitors. J Speech Lang Hear Res. 51(1):147-59. Fligor BJ, 2007. Hearing loss and iPods:What happens when you turn them to 11? The Hearing Journal 60(10): 10-6. Fligor BJ, 2009. Risk for noise-Induced hearing loss from use of portable media players: A summary of evidence through 2008. Perspectives on Audiology 5(1): 10-20. Oliviera R, Babcock M, Venem M, Hoeker G, Parish B, Vasant K. 2005. The dynamic ear canal and its implications. Hearing Review: 12(2): 18-19,82. Palmer CV, 2009. Affecting life-long habits of school-age musicians. Perspectives on Audiology 5(1): 21-7. Pirzanski C, 2001. Earmolds: Are soft materials superior?. The Hearing Journal 54(7): 36-42. Pirzanski C, Berge B. 2003. An ear impression technique that works. Hearing Review.10(4):18-20,80. Pirzanski C, Berge B, 2005. Ear canal dynamics: Facts versus perception. The Hearing Journal 58(10): 50-8. Shure - Static Electricity Discharge through Headphones / Earphones? Shure - Shure earphones and headphone amp? Shure - How can I tell which sleeve size I am using? Another newbie here, to say thanks very much for this article. A great starting point, and plenty of links on where to get more information. an article worth reading to enlighten newbies like me. thanks! Wow man! really great tuto!